It's Saturday afternoon and I'm currently sitting in Starbucks. I'm working on some projects and trying to stay warm on this very chilly day. I can't believe that it's time to write another week of these posts! I'm going to finish writing and then hope that Darrin takes me to grab a snack somewhere because I had Chipotle for lunch and it wasn't too good. I think my Chipotle obsession is a thing of the past and I've moved on. To what? I'm not exactly sure. But I'm just not feeling Chipotle lately. Anyways, instead of listening to me ramble about my break up with Chipotle, let's get to this weeks bits and pieces of gratitude! Today I found out some exciting news and ate a lot of chocolate. // I don't typically work on Friday's but I did today and instead of dreading it, I enjoyed the process and went with the flow. I think that the more focused you are with living in the present, the more that you enjoy your experiences regardless. It's a point that has taken me so long to get to and something that I still work on daily. But it's very rewarding and worth the constant effort and energy. Each day I experience certain things. A lot of them are reoccurring circumstances but there are also the instances where new thoughts, feelings, and experiences arise. Each situation, new and reoccurring, can teach us something. From a good experience you might learn more about what you do want and from a bad experience you'll learn how to deal with the bad and let it go from your life in a healthy way. I am grateful for each experience everyday. Good, bad, and everything in between. Each of these teach me a little bit more about myself. I'm guided in the direction that I am meant to be going by letting myself experience it all fully. // I'm in search for more people that I can welcome into my life to have thought provoking and engaging conversations. Lately I feel as if they're so important and quite inspiring. // Also, making the goal to post a bit about what I'm grateful for each day has pushed me to open up a bit more about my life and I am so excited to see how this experience transforms my writing and myself as a whole in the end. Each day I don't take the time to sit down and write like I wish I did, but I'm working on it to make it happen more and just feeling really inspired to make that happen tonight. I love sunsets. Every day I try to catch at least a glimpse of the sunset even if that means I run outside while cooking dinner and take it in for a few moments. Tonight I did just that and came to find this view. I wanted to sit outside and watch it but I wasn't dressed properly for the chilly temps and I was in the middle of dinner, so I went back inside. That moment made me nostalgic for summer when I could lay in the grass and watch the sun wash away another day. But it also made me think about how I went to California in 2013 and made it a goal to see the sunset over the Pacific Ocean. It didn't happen for a few reasons and I pushed the thought to the back of my mind for years. But now I'm thinking about it again and I am making it a goal to make that happen either this year or early next year. // Without chasing the sunset each day, random thoughts like wanting to see Pacific Ocean sunsets wouldn't happen. There are so many thoughts, goals, and ideas that I would miss out if I didn't try to tune into nature as much as possible. That's not something I want to miss out on, it's something I want to experience so much more of. So I published this recipe on www.createnplate.com tonight ((obviously!!)) // I also just ordered something that will help me out with creating better content and I am so excited! // Do one thing each day to get a bit closer to your goals. I watched Cowspiracy again tonight and each time I feel so much more passionate about veganism. I'm not really a "preachy vegan" but whenever I watch documentaries involving veganism it makes me want to speak out more about the truth behind the animal industry. I think I've come up with an easy way to do this and I'm excited to share. Check back Friday for more! And until then, go watch Cowspiracy and learn or refresh yourself about animal agriculture and environmental facts. I made this cute little smoothie bowl today in honor of Valentine's Day coming up this weekend. I'm not really big into celebrating but making fun Valentine's Day foods in something I'm into. // Took an unexpected rest day from the gym today because I seem to have a bit of a cold. I took advantage of being able to sleep in (until 6 a.m. haha) and have a relaxing morning in bed. Sometimes that's exactly what you need! Today I received a special package in the mail that I'll be sharing pieces of with you all very soon. I'm so excited! I am so grateful for all of the connections I have made through this platform. I hope to drink green smoothies with you all someday. // Spent some time relaxing today to hopefully be rested and healed up enough to get back to the gym tomorrow. It's nice to take some time away from it though and spend my mornings in a much calmer way. 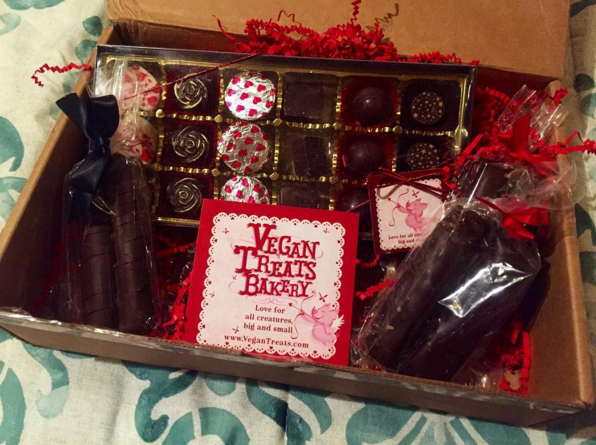 Darrin surprised me with this box of Vegan Treats chocolates tonight 😍 I was so surprised and excited about it after being sick all week. I've tried all of the chocolates in the box tonight and declared every piece "my favorite and the best one." They're so amazing and I'm so excited to have them!